did greco say how many months it will take before u see new hair coming out? how much did greco charge? did he show u any other before and after pics that we haven’t already seen in the forum? can you post some before pics? I had it done last Tuesday. It take four months to see noticeable results and continues until month 8 and then starts to diminish. If you get PRP with the ECM the cost is 1K. The extra cellular matrix holds the PRP in the scalp for a much longer therapeutic time, so it is worth the extra 200 bucks IMO. My guess is Dr. Grecco is onto so big things and this version will not compare to the one coming in the months ahead. Lots of reasons for optimism. Was this PRP treatment in conjunction with an HT or stand-alone procedure? » Was this PRP treatment in conjunction with an HT or stand-alone procedure? Right now most people are getting it as a stand-alone treatment as a trial. Still a lot of unknown at this point as to how effective the treatment really is. Watch this video. It will give you a better idea how it works. I did it as a stand alone. I have had TP in the past. Dr. Greco has treated hundreds of patients so it is KNOWN what it does. If you have minaturized hair it will thicken them in most cases, possibly back to your pre-balding thickness. If you are slick headed it will not work as of yet. Other things are in the works. Version 2 will be even better. » pre-balding thickness. If you are slick headed it will not work as of yet. » Other things are in the works. Version 2 will be even better. If he had treated hundreds of patients, should there be more before and after pics on this website? I only see 1 or maybe 2. » » Other things are in the works. Version 2 will be even better. » after pics on this website? I only see 1 or maybe 2. Over 300 patients. The problem with PRP right now, although it works, it can be much better. Platelet rich plasma contains growth factors that are positive for hair growth and some that are not. IF you can isolate which GF benefit hair growth and remove the others while manipulating stem cells then LOOK out… . » » » Other things are in the works. Version 2 will be even better. » » after pics on this website? I only see 1 or maybe 2. » then LOOK out… . This all sounds very promising and I am highly optimistic about it but I do have a question. As it stands this seems like a temporary solution. If the growth period wanes around the 8th month then you would need to get treated approx. every 8 months. Does anyone else think $1000 1-2 times a year is a bit expensive for a temporary solution that may not provide significant results? How long did it take for the scalp to heal? Is the procedure suppose to be effective anywhere on the scalp or only in certain parts, like the crown? It gives visible results and doesn’t involve strip scarring or further loss of donor hair. That’s all it takes. With our pitiful current options for fighting MPB, we’re pretty much a captive audience for anything that works at all. They could probably charger $2K a year and still get guys lining up outside the building. » lining up outside the building. The price will come way down. There is really not a lot of expense involved. The procedure can be done in 30 to 45 minutes. MY guess is around 300 dollars will be the market rate after competition hits the market. However, I think Dr. Greco will be ahead of everyone else in version 2. Back to your question though, yes you have to have it done every 6 to 12 months. Keep in mind the PRP with the ECM should work much better and there are NO PHOTOS published of this treatment. So expect better result pictures to be released. Dr. Greco is doing some cutting edge work. He believes the path is set to cure this disease or at least GREATLY improve the treatments. There were visible signs the day i went home, very little to none on day three. A little soreness but that’s it. I am only at the 1.5 month mark so no point in saying anything either way until the important 4 month mark. I don’t want to raise or dash anyones hopes by posting possibly misleading comments so early into the treatment. I was extremely impressed with Dr Greco and his staff, who were all very friendly and professional. It is clear that Dr Greco truely believes in this treatment and he has plans to improve the formula dramatically over the coming 12 months. I certainly hope to go back for version 2 when it becomes available, even if this version doesn’t help much…and especially his later versions he has planned ! Also, there is ONE set of “PRP Plus” 8 month pictures out already. This 26 year old male was unable to take finasteride 1mg (Propecia), due to side effects, so he elected to have frontal hairline transplantation. His posterior crown was traumatized with a 1mm micro needling roller (Clinical Resolutions, Inc, Beverly Hills, CA) and platelet rich composition was injected throughout the area. No hair transplantation was done in the crown. Fig 1, below left, is the before photo of the posterior crown and Fig 2, below right, is the same patient eight months later. 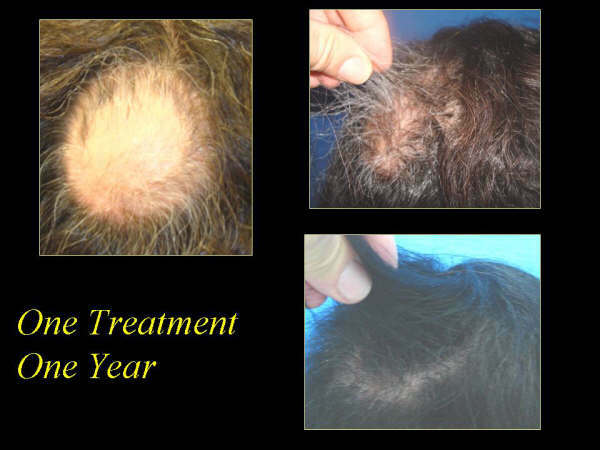 This case demonstrated a reversal of non-transplanted hair miniaturization after eight months in the posterior crown and aesthetic thickening of his hair, without taking medicine or having surgery. It is “completely safe” because it is his own cells. Like Propecia, cellular therapy works best in younger patients just loosing their hair and results vary from patient to patient. Where is Dr. Greco located? Does he have a website? accurate SPQR … no difference. we will never have a full head of hair of new with these results. » to side effects, so he elected to have frontal hairline transplantation. » crown and Fig 2, below right, is the same patient eight months later. Does this mean us older ones shouldn’t bother then.I’ve still got a lot of miniaturization hair,I can feel it,but have to get close up to actually see it.